The Raimi movies were brilliant, and I love all of 'em to pieces, but I guess it was just time to start moving in a different direction. I'm totally fine with re-casting and starting with a new mythology, I've been watching Batman and Bond movies all my life after all, but there is one thing that still kind of stings. After seeing Dylan Baker brilliantly bring Doctor Curt Conners to life across three movies, we'll never get the chance to see him play The Lizard. Okay, you can go back to checking out the Apple news now. Funny, I actually checked out the apple news before i got here...you picture is much prettier...in a "Holy Cow, the Lizard is going to bite my arm off!" kind of way! Chills, brutha, chills! 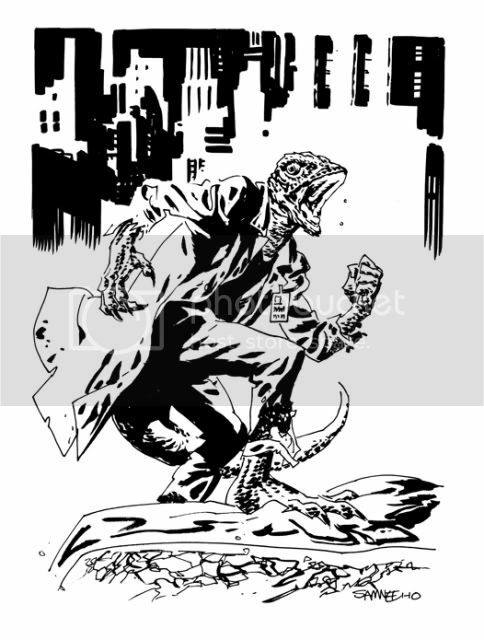 Your Lizard has all of the best elements of the original Ditko design, and the result is creeptastic. Despite the reboot, isn't it possible that filmmakers will hold onto a few supporting cast members... Baker and Simmons would be two great losses. No JJJ will be as dead on as Simmons was. That Lizard looks like he should. Well done. Brilliant sketch by the way! Very Creep-tastic version of the lizard,Very Nice!